Using blockchain technology and the Stellar protocol, IBM Blockchain World Wire makes it possible for financial institutions to clear and settle cross-border payments in seconds. The institutions use their existing payment systems – seamlessly connected to World Wire’s APIs – to convert the first fiat currency into the digital asset. World Wire then simultaneously converts the digital asset into the second fiat currency, completing the transaction. All transaction details are recorded onto an immutable blockchain for clearing. Central banks and digital currencies: what comes next? Bitcoin mania has led some to believe that banks are no longer needed for secure global money transfer. Banks, however, disagree. 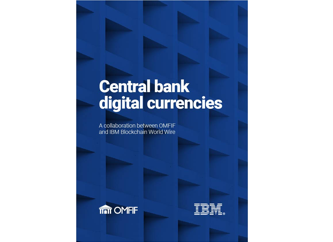 Learn how they’re examining the viability of digital fiat currencies as complements to physical cash in this report from IBM and the Official Monetary and Financial Institutions Forum. Working together, we’ve surveyed the latest attitudes and actions of 21 different central banks as they study the adoption of central bank digital currencies. Our convening power brings together incumbents and FinTechs, ensuring collaborative innovation with data security, compliance and consumer focus. We work with you to ensure that IBM Blockchain World Wire is compatible with your existing payment systems, making it as seamless to adopt as possible. Backed by the right experts, access and our collaborative approach, we’re building and running scalable, industry-shaping blockchain networks. Our cross-sector relationships and technical expertise are creating systemic change, helping you reach new customers and enter new markets. The world’s most important data is entrusted to IBM. We’ve built and deployed more than 500 blockchain solutions already changing the way business is done. And IBM runs over 60% of the world’s transactional systems. Revolutionize the way you clear, settle and manage cross-border payments with IBM Blockchain World Wire. * For those preferring to avoid the use of digital currencies, IBM also provides alternative settlement methods. ¹ Global payments 2017: Amid rapid change, an upward trajectory.